Tuesday • May 13 • 2014 Volume 81 • Number 19 INSIDE: Menards n Bomgaars n Employment n Dining n Presorted Standard US Postage Paid Permit #8 ECRWSS Vermillion, SD Sears n One In A VerMillion n bp Broadcaster Press Postal Patron Local Since 1934 201 W. Cherry n Vermillion, SD 57069 n Phone: 605-624-4429 n Fax: 605-624-2696 n www.broadcasteronline.com Don’t Have A Job? Underemployed? Consider the Summer IT Academy. Earn an undergraduate certificate with credits that get you closer to graduation. Partners include: The Information Technology Consultant Academy–Summer Institute integrates 4 undergraduate courses with an internship, which will provide participants a unique credential entering an IT-related profession. Courses will be offered online. Apply today – www.usd.edu/cde/summer-it.cfm Earn 12 credits at a discounted rate of $40 per credit hour saving over $3,000 on tuition costs. CONTACT US DIVISION OF CONTINUING & DISTANCE EDUCATION Summer Session Dates Standard Track Advanced Track* Session I & II: May 19–June 27 CSC 192: Topics: Introductory Programming BADM 492: Database Management BADM 492: Database Management Session III: June 30–July 18 CSC 492: Software Engineering CSC 492: Software Engineering Session IV: July 21–Aug. 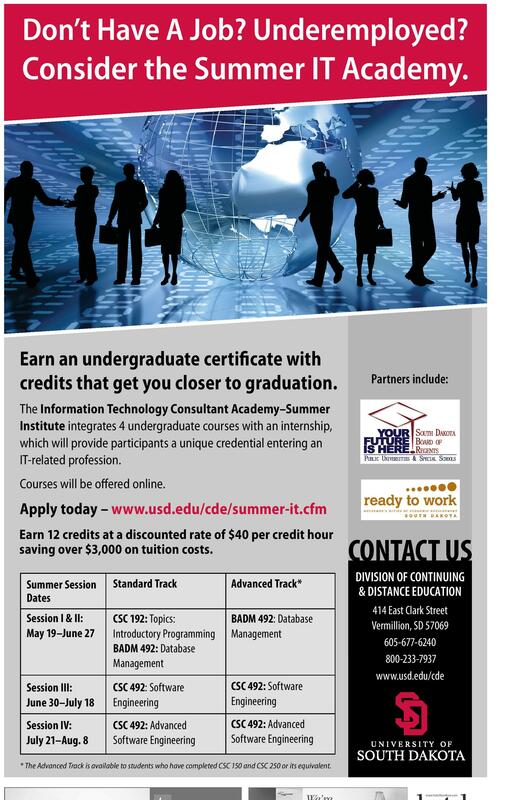 8 CSC 492: Advanced Software Engineering CSC 492: Advanced Software Engineering 414 East Clark Street Vermillion, SD 57069 605-677-6240 800-233-7937 www.usd.edu/cde * The Advanced Track is available to students who have completed CSC 150 and CSC 250 or its equivalent. See what’s brewing on the job market. Help Wanted Section We’re making progress on our remodel! www.hatchfurniture.com FURNITURE &MATTRESS 109 East Third, Yankton 605-665-4416 • 800-798-4663 M-F 10-6, Sat. 10-5, Evenings by Appointment We’re remodeling our entire store with the experience of a world famous designer. Come in now for 50% and more off furniture and accessories.